It's time for another episode of 205 Live on the WWE Network! After last week's Raw when all the cruiserweights attacked the new Cruiserweight Champion Enzo Amore, they all lost their opportunites at a future championship match against the champ. However, Raw General Manager Kurt Angle just signed Kalisto to the division, possibly making him the next contender! How will Enzo respond to this? Tune in to find out and hit F5 to refresh the live recap! Last night on Raw, Enzo Amore made fun of EVERY one of the cruiserweights at ringside knowing that they would get fired if they touched him. Kurt Angle confirmed that fact, but also introduced a new member of the cruiserweight division, Kalisto! The Lucha superstar showed Enzo what he's capable of finishing him off with the Solida Del Sol. Cue the opening video (which already features clips of Kalisto) and the welcoming announce team of Vic Joseph and Nigel McGuinness. Kalisto makes his 205 Live debut against Ariya Daivari tonight. Also, Jack Gallagher and Cedric Alexander settle their differences tonight. LUCHA! LUCHA! We waste no time getting the show started with the newest 205 Live signee and former United States Champion! Kalisto: "Kurt Angle yesterday gave me the opportunity of a lifetime to join 205 Live. I SAID YES! ¡Claro que si, vámonos! The cruiserweights in the back are the hardest working guys I have ever met!" 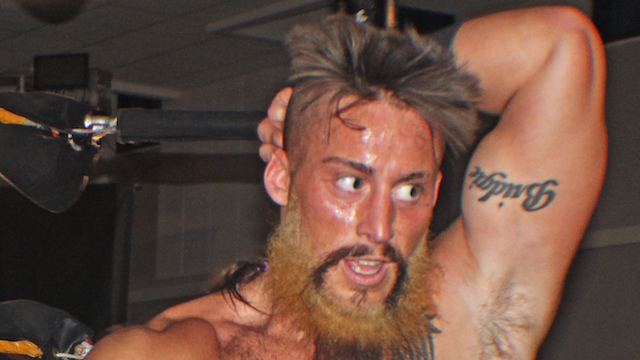 Enzo Amore's music cuts him off and he struts onto the stage. Enzo: "My name is Enzo Amore, and I am a certified G and a bonified stud, and you can't teach that! Bada-boom, realest champ in the room, how you doin'?! You know Kalisto, you have got to be the luckiest luchador in show business. It's true. You might be a lucky little lucha leprechaun, but you should be counting your lucky ducks rather than having the nerve to step foot on the 'Zo Show dressed up like a schmuck! Seriously bro, I would be embarrassed to donate that outfit to the Salvation Army. But you know what? I'm a good guy, I would donate it, but ultimately I'd be embarrassed, OK? You are the hottest new cruiserweight signing, but listen up you little Red Hot Chili Pepper. We couldn't sell one of them luchador masks if we +gave it away, gave it away now+. They only place you kids and weird adults can buy a Kalisto mask is on WWE.com. But hey kid, don't worry, all that's gonna change for you. Pretty soon in a city near you, at a merchandise stand near you, there'll be Kalisto masks everywhere 'cause you're on the 'Zo Show. And I am where the money's at. I'm the reason why 205 Live is trending 'cause Enzo Amore is the Cruiserweight Champ. All the success comes the haters, all the cuppa haters. Hey people, it's a 2-for-1 special and everybody's buying. I know this ain't the weekend, but if I gotta give you a reminder..." Kalisto: "Wait wait wait, reminder? First of all, you talk too much man. Let's show the entire world and remind you how you won that Cruiserweight Title. Hey guys, let's show Enzo how he won. Just watch." We get a clip from No Mercy of Enzo kicking Neville in the balls to win the title. Enzo acts like he kicked a field goal. Enzo: "Maybe I should give you a reminder. Wait wait wait, seeing as that I've forgotten more than you'll ever know, I'll provide you with new information for ya. Winning is winning, whether it's by an inch or by a mile, alright centimeter? That's right, I called you centimeter. Hey, the Amore Credit Bureau ain't gonna breathe down your neck, I'll give credit where credit is due. I've seen you go toe-to-toe with Braun Strowman. But ultimately you ended up in a trash can. What I'm trying to figure out is, why GM Kurt Angle thinks it's OK to litter that trash all over my lawn, the 'Zo Show! I'll give it to you kid, you've got potential, but ever since you lost that U.S. Title, you ain't been nothing more than a lucha let-down. A disappointment, coupled by the fact that you're a hater, just like everybody else in the Cruiserweight Division. And I can hear the haters here, the same haters that are 205 Live fans that love cruiserweight wrestling, they call ME a disgrace to the Cruiserweight Division. You what I think is ffunny about that people? Those same haters are the people who roll up on me like the paparazzi begging the realest champ in the room for an autograph at every airport in the country! You know what? I sign it, I do, cause I still got love. Enzo Amore, this is the 'Zo Show. I gotta give the people what they wanna see, the 'Zo Show is all about in-ring competition. So who wants to see the in-ring debut of Kalisto? You wanna see Kalisto on 205 Live? More importantly, we're gonna talk about your opponent, the guy who's gonna hand you an L tonight. The Persian version of Drake, the guy who's got style and grace - despite anything I said about the guy last night. This guy is gonna be the biggest Persian thing to hit the screen since the Kardashians. Ladies and gentlemen, DAIVARI!" Enzo shakes Daivari's hand before heading to the back. Daivari attacks him at the bell and gets in his face. Kalisto kicks him in the legs, front kick, headscissors takedown, Daivari rolls out the ring, Kalisto does a springboard flip and throws him back in the ring as Enzo looks on from backstage. Daivari pulls the top rope down and releases it to snap against Kalisto's head, so now he takes control of the match. Kalisto avoids a body slam, but runs into Daivari's boot. Daivari pummels him in a corner, snapmare, knee to the back, then applies a chinlock. Kalisto gets to his feet, jawbreaker, ducks a clothesline, corkscrew headbutt, dropkick, hurricanrana spike DDT, and gets a near-fall. Daivari blocks the Solida Del Sol, plants him with a spinebuster, gets on the top rope, nails the Persian Lion Splash (frog splash) and gets the 1-2-KICKOUT! Kalisto catches him with the SOLIDA DEL SOL and gets the 1-2-3! WINNER: KALISTO. Enzo continues to talk trash from backstage watching Kalisto's victory celebration on a monitor. LUCHA! LUCHA! LUCHA! We get a video package of the feud between Brian Kendrick and Jack Gallagher, but unfortunately for Cedric Alexander, Gallagher decided to join forces with Kendrick. Later tonight, Gallagher will face Alexander. Backstage, Drew Gulak is again holding his sign that reads "NO CHANTS" and he will be in action next after the break. Gulak heads to the ring with his sign and stands it at ringside. Gulak: "Thank you. Lately there has been a lot of talk regarding the changing landscape in 205 Live, but before that became en vogue I was talking about the changing landscape in 205 Live. I consider myself a grassroots fellow, but that does not mean that I am not afraid to reach for the stars in an effort to create an idealistic Drewtopia. How unfortunate last week when Mr. Tozawa had to interject in an attempt to silence my voice, thus robbing all of us the remaining 269 proposals in Drew Gulak's plan for a better 205 Live! Which, in case any of you had missed my prior proposals, they're available exclusively and on demand on the award-winning WWE Network! Also, as an added bonus tonight before my match, I would like to conduct plans 8 through 277 of myyyyy PowerPoint Presentation! Yeah! Please direct your attention to the TitanTron for Drew Gulak's Plan for a Better 205 Live. Proposal #8: No Flipping. A most important proposal, if one is turning up down and down up, how on Earth are you gonna know your left from right and your right from wrong?! That's right, and now slide #9!" Instead, what we see is Mustafa Ali heading out. Before the match starts, Akira Tozawa comes out with a chair and does his war cry/chant as he takes a seat on the stage. Gulak yells "No chants!" at Tozawa then locks up with Ali. They trade wrestling holds and submissions, Gulak with an armbar, Ali counters into a snapmare, Gulak headbutts him in the midsection, trips him up, Ali kicks him off, Gulak falls out the ring, and Tozawa does his chant. Gulak can't stop staring at Tozawa then waves his sign around before rolling back into the ring. Gulak backs him into a corner, Ali with a side headlock, Gulak pushe shim off, Ali backflips and Gulak tells him "No flips!" Ali gives him a hiptoss, hurricanrana, jumps to the floor and dropkicks him. Ali gets on the top rope, hits a diving crossbody and gets a 2-count. Ali flips over him, Gulak blocks the tornado DDT, Gulak suplexes him onto the top rope, knees him in the chest, covers for 2, then puts him in a shoulder claw submission hold. Tozawa continues does his chant again, which distracts Gulak, but he remains in control by putting Ali in a straitjacket chinlock with knees to the back. Ali breaks free with a snapmare, chops him on the chest, pop-up dropkick, gets tossed onto the apron, and does the slingshot rolling neckbreaker for a near-fall. Ali lans on his feet from a suplex, O'Connor roll, kickout, Gulak sends him into the turnbuckle and then suplexes him into the middle turnbuckle. Tozawa chants again, Guak gets slightly distracte, charges, Ali side-steps him, kicks him in the head, climbs back to the top rope, hits the 054 SPLASH/IMPLODING 450 SPLASH and gets the 1-2-3! WINNER: MUSTAFA ALI. Tozawa walks to the ring, stands over a fallen Gulak, and gets his chant going again. Next week on 205 Live, Rich Swann will finally face TJP one-on-one! Backstage, Dasha Fuentes interviews Brian Kendrick, but he cuts her off and says he feels sympathy for Cedric Alexander. He goes onto to say that he feels bad and responsible for being apart of the mob that attacked Enzo Amore. He claims to be a victim of mob mentality just like Daivari. He turns his attention back to Gallagher vs. Alexander, says he will be ringside to watch the match, but then Cedric Alexader jumps him and atttacks his leg!! Kendrick is left holding his ankle writhing in pain. Alexander storms to the ring not taking his eyes off Gallagher. The bell dings, Alexander stomps him down in a corner, gives him a hiotoss, hits a hard European uppercut, and another, throws him into a corner, Gallagher pushes him back, Alexander dropkicks him, but then takes a spill to the floor. Gallagher kicks him a she gets back in, stomps on his face, then puts him in a rear chinlock. Alexander battles back, Gallagher does a snapmare, face twist, slaps him away, takes him back and gets a 2-count. Gallagher kicks him down in a corner, stomps on his head, does a leg twist, stomps on his knees and covers for onily 1. Gallagher puts him in a front chancery, Alexander gets to his feet, forearms, Gallagher dropkicks him and gets 2. Gallagher kicks him in the chest, Alexander just absorbs each shot, hits a back elbow, suicide dive through the bottom ropes, pummels him, throws him back in the ring, Gallagher rolls out the other side, so Alexander kicks him and tosses him into the barricade. Alexander breaks the referee's count, Gallagher hits a back elbow, crawls under the ring, comes out the other side and takes him out then throws him back in the ring. Gallagher picks up his umbrella, Alexander steps on it to prevent any dramage, takes it for himself, the referee warns him not to use it, but Alexander does anyway and hits him in the back! WINNER by DQ: JACK GALLAGHER. Alexander continues the beatdown of Gallagher by tossing him into the timekeeper's area and across the announce table. IT'S A BRAWL! Both men beat each other up around ringside until several referees come down to separate them. The crowd wants more as they chant "Let them fight!" Alexander gets on the top rope and dropkicks Gallagher! Alexander holds down the ring as Gallagher rolls out, and Kendrick limps down the ramp to check on Gallagher. Alexander wants more but the two men just sneer at him from the ramp.